Laguna Asphalt Paving is Orange County's asphalt specialists since 1975. Our professional pavers have extensive knowledge in asphalt paving and maintenance, as well as experience working on thousands of paving jobs. 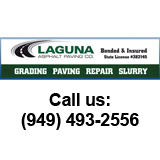 Laguna Asphalt Paving is fully insured, licensed and bonded.